Grangetto's Farm and Garden Supply Services - » Is it a Bug or Is it a Fungus? Is it a Bug or Is it a Fungus? Telling the difference between insects and fungus or disease problems is not a simple task! Remember when giant whitefly first showed up? Many thought it was fungus because of the fuzzy filaments hanging from the undersides of the leaves and reacted by spraying fungicides, which weren’t any help at all. Actually, insecticides didn’t help much either–as we soon found out–due to the many generations present (some of which were resistant) at the same time. Since the mouthparts of giant whiteflies are long and tubular, a good blast with the hose is actually one of the best methods of getting rid of them! Many other bugs also leave damage that looks much like fungus. 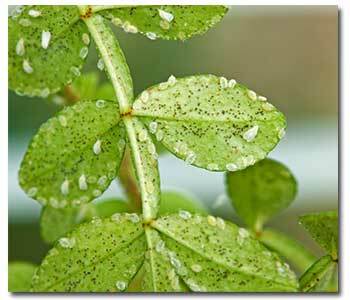 In some cases, such as aphids (honeydew produced by the aphids promotes the growth of sooty mold), they actually attract mold or fungus. Using a fungicide may get rid of a symptom but leave the original problem. Another example: small holes in the leaves of plum, nectarine, almond, and apricot trees are actually symptoms of “shot hole” fungus, but if you see tiny holes in your eggplant’s leaves–you probably have flea beetles! As you can see, diagnosis is not always easy! Bring a sample in and we’ll try to help diagnose problems and find the best cure for your problem. As always, the first and best line of defense is prevention. Keep plants healthy–avoid injuries (such as hitting trees with lawnmowers, etc.). Choose varieties that do well in your area and are naturally resistant. We can help you choose resistant plants that will thrive for you. Disease occurs when the conditions exist to allow it. It is an interaction between the pathogen (causative agent), environmental conditions, and host (plant). All these must be present. That’s why prevention is so important. Consult our garden professionals for help. Pathogens: Microorganisms that cause disease. Host: Plant that sustains the pathogen. 1. Make sure the spray is getting UNDERNEATH the leaves. Mites, whiteflies, and many others spend most or all of their time there, so spraying only on the top surfaces will not control them. 2. Don’t spray a bone-dry plant, and don’t spray in the middle of a very hot day. Early morning is a good time to spray because it’s usually cooler and less windy, and the insects are less active–so more spray hits the pests. 3. Follow all label directions. Don’t use a more concentrated spray than the label recommends–you can easily burn your plants, and usually it is no more effective on pests. If you have any questions, don’t hesitate to consult our garden professionals.